I’m a Duke College basketball fan…. I know who the big is…. Cable sports pundits have been foaming at mouth about big guy all season…. He literally carried his team into this years finals with his strong’o to hoop’ moves…. He got even more exposure when his Nike sneaker blow out on him on national TV…. Now that Duke has been eliminated from the rest of play? Who will end up paying the Duke star BIG money (Millions) to play for them…. The above is the e side story…. The main story is who gets the sneaker contract with the 20 year old…..
Likely No. 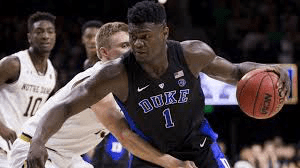 1 pick Zion Williamson is expected to sign a lucrative sneaker endorsement deal prior to this year’s May 14 draft lottery, with sneaker companies confident he’ll be a marketing superstar no matter where he lands. Why it matters: Many in the sneaker industry believe Williamson’s deal will make him one of the three highest-paid rookie sneaker endorsers ever, rivaling LeBron James and Kevin Durant. Details: Zion will almost certainly get his own signature shoe, which is something only nine rookies in league history have ever gotten….